WindRider and their design partners developed the original concept of bringing foiling to the everday sailor back in 1998, well before foiling became popular. Click the image below for a video of original RAVE. 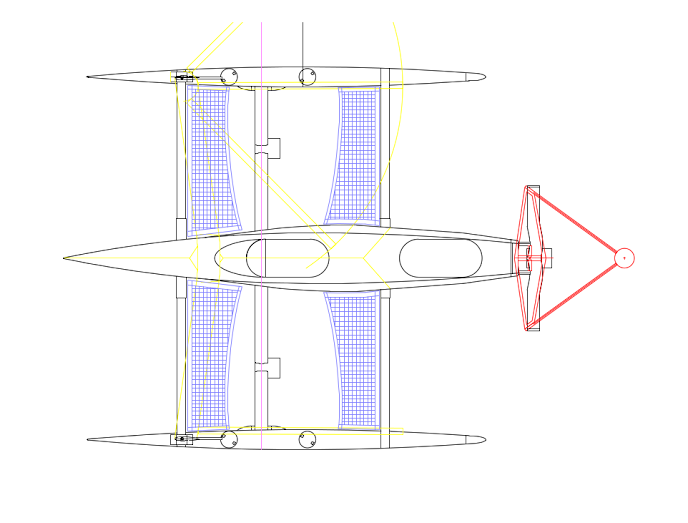 And now, WindRider RAVE will be brought back into production as RAVE V. Leveraging WindRider’s image of “Sailing Simplified” our goal is is the same as when originally produced: bringing a foiling sailboat to the average sailor. There couldn’t be a better time. It took the exceptional media coverage of America’s Cup races in 2013 for people to fully appreciate the excitement of sailing on foils. And since then more foiling boats have come to market – but all are either expensive, complicated, require exceptional agility and skill, or all of the above. WindRider has built its reputation on “Sailing Simplified” so our goal is not only to make foiling available to the everyday sailor, but go a step further and provide individuals with disabilities the opportunity of “flying on water”. What will the RAVE V look like? Other than the sail plan and the foils, a lot like the original RAVE. It will not be rotomolded plastic, but rather strong and lightweight composite material. As you can see in the rendering, the RAVE V hulls will be configured similar to the original RAVE with the comfort oriented face-forward seating in aft (pilot) and forward (passenger) cockpits. Foot pedal steering (plus Adaptive Sailing modifications as needed including hand steering) allows for ease of handling the sails and overall “sailing simplified”. Beyond the main hull and amas, the RAVE V will be further advanced in design than the original RAVE due to three main design enhancements. 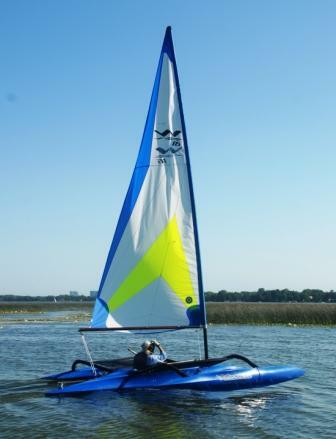 Retractable “V” foils, thus the RAVE V name, are an advanced design, further enhanced by sonic tubes at the tips, which reduce cavitation during foiling. 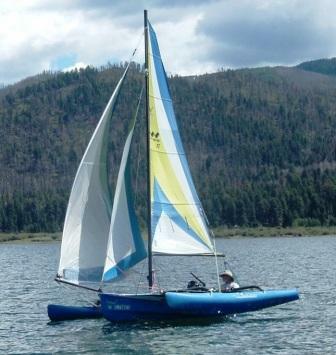 “A-frame” rigging with two main sails enhances foiling and pointing performance. Telescoping amas and fixed crossbeams will allow for easier rigging at the boat ramp. The retractable foils will allow the RAVE V easy beach and dock access as well as allow for a good sailing experience in light winds. Face forward, below the boom cockpit seating for two with foot pedal steering and/or hand steering provides flexible accomodations for sailors of all abilities. 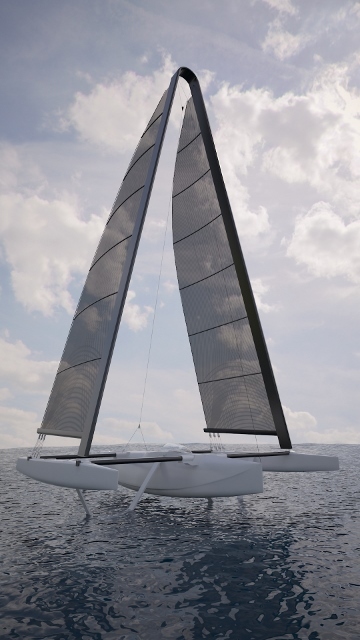 The A-frame standing rigging configuration and light weight composite material construction enhances foiling in lighter winds. 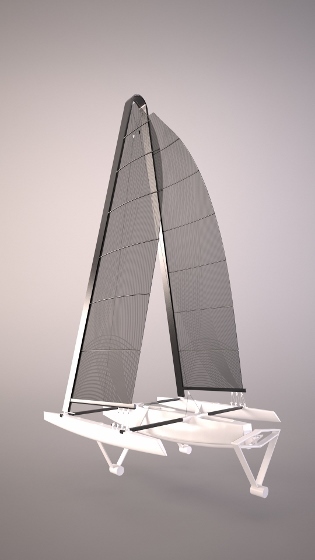 The combination of dual mainsails and V foils permit the RAVE V to point to wind better than most multihulls. Total boat height is 31 feet from bottom of sonic tube to top of mast. Mast height above the deck is 26.1 feet. The semicircle mast top is 20 inches in diameter and a 10 inch cord designed to eliminate sail top spillage and drag losses. Sail foot is 7.2 feet with a boom of 7.5 feet. Why are you raising money this way? 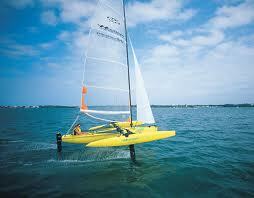 Other foiling sailboats on the market today are expensive, complicated and require exceptional agility and skill. The RAVE V is affordable, comfortable, durable and relatively easy to handle. 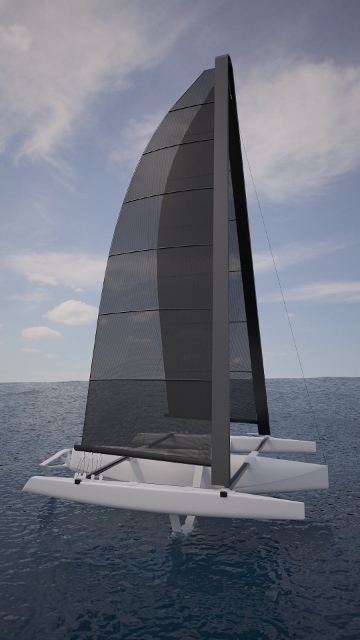 The trimaran design, cockpit face-forward below the sail seating and foot pedal steering all contribute to stability, comfort and ease of use compared to other foiling sailboats on the market. Crowdfunding is a relatively new tool for raising capital to bring innovative products to the market. By sharing the innovation through social and traditional media, the product is exposed to more individuals who then have the opportunity to participate in the process and purchase the product – sometimes at a discounted price. And the RAVE V is specifically designed to appeal to a broad range of boating enthusiasts. Experienced and intermediate sailors will have the ability to learn to foil. New technologies in foil construction and building material allow for the innovative design enhancements which create the improvements to the original design. The 5 design objectives outlined above will place the RAVE V in a class by itself. With a composite hull and amas compared to the previous polyethylene model, weight will be reduced allowing for foiling in lighter winds. Aluminum spars will be replaced with carbon fiber as well to reduce weight and increase strength. Funding from this campaign is the amount necessary to help provide the cash flow necessary to pay the designers, and build the first six boats. In essence, pre-sales of the first six boats at a discount will provide the working capital for material and labor (getting us into full production) and deposits for subsequent 20 boats will help continue funding production. It is our intent to build 26 boats prior to sailing season 2016. WindRider is contributing subtanitial funds for toolng, marketing, production space and the like. YOUR CREDIT CARD PLEDGE IS ONLY CHARGED IF WE REACH OUR GOAL. What else is up with WindRider? WindRider was founded in 1995 and has been under current ownership since 2010. We currently produce 3 models of sailing trimarans, WR17, WR16 and WRTango, and import 4 models of Astus trimarans from France. 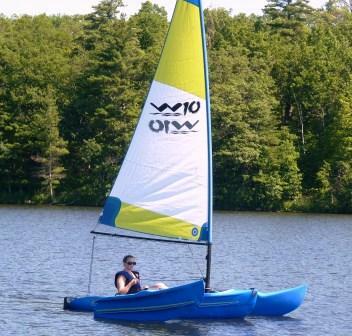 We are currently broadening our product line to include replacement parts and accessories for a variety of sailboats. Larry Knauer is Designer and Director of RAVE V. He spent 26 years with Lockhead Martin, most recently as Director of Propulsion Subsystems and 6 years as President of Pratt & Whitney’s space propulsion division. With an M.S., Management Science, Massachusetts Institute of Technology, Boston, Massachusetts and a Sloan Fellow, Bachelor of Aerospace Engineering, Georgia Institute of Technology, Atlanta, Georgia. In addition to his personal experience over many years as a trimaran sailor, Larry’s educational and work experience brings a valuable and unique perspective to the RAVE V hydrofoil. Licensed glider pilot. Clayton brings thirteen years of experience in Aerospace Mechanical Engineering with a background in design of structures, mechanisms, and fluid systems. He works in various methods of manufacture and assembly which will be key in maintining quality and lowest possible cost. Proficient in AutoCAD. 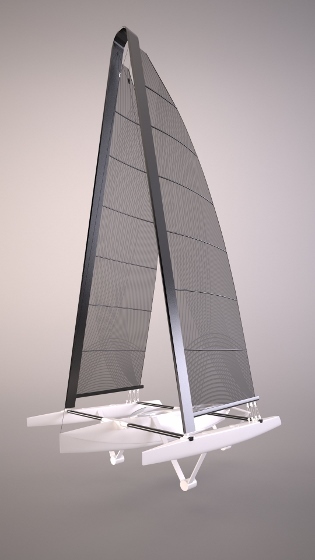 Sailing and yacht racing including high performance planing monohulls, multihulls, and performance handicap rated monohulls; sailboat design and building emphasizing strong lightweight and ultralight construction. Private pilot. Robert Sanberg loves sailing and loves WindRider sailing trimarans. He understands our customers' need for speed, comfort, safety, affordability, simplicity and FUN! And he knows the WindRider boats inside and out. Dean has a love of all things on and under the water. The WindRider Experience reflects his appreciation of the water environment - enjoying it, sharing it with others and protecting it. Purchase one of the first six boats and receive a big discount. Place a deposit on the second or third production run with the option of receiving a discount on a different model of WindRider trimaran. AND REMEMBER, YOUR CREDIT CARD PLEDGE IS NOT CHARGED UNTIL WE REACH OUR GOAL! ​If you have questions, please call us 888-609-2827 or email Dean at WindRider. Thanks in advance for your support.